News of Mary Theocharides leaving us this week was hard to swallow on several levels. The Theocharides family was an important part of the Stockton St. 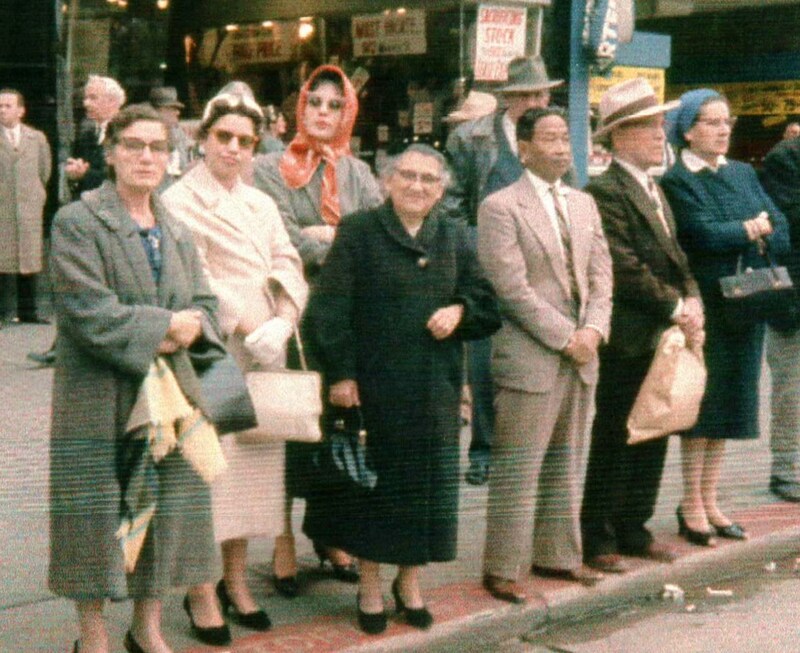 Basil's Greek Community for many years before moving to Thessaloniki and the American Farm School circa 1960. There were many good (verging on crazy) times in the days when the church really was the center of our lives. Harry, Mary, Terry and Nico were part of the Xanttopoulos/Sarris families, too. And to make a very long story short, our ties -- from Stockton, to Thessaloniki (where I was for 10 years at the School) and back again -- run deep. Evgenia Sarris, Mary Theocharides, Liberty Sarris and Harry's mother. Terry and Nico will surely have many great stories to tell after their mother's funeral at St. Basil's on Friday at 10 am. But this isn't just about memories and stories. It's really about an entire and in many ways heroic generation -- along with their belief system and work ethic -- having left us one-by-one. And that is VERY hard to swallow. May dear Mary's memory -- and those of all our parents/relatives -- be eternal. Zoi se mas. Naousean skier will carry the Greek flag at the Olympic Games! As I prepare to return to my father's hometown of Naousa for my fourth 3-month stay, I am really looking forward to Apokries. This is a super special time in Naousa, where the Carnival tradition is nothing like we see on TV from other parts of Greece or Rio or New Orleans. 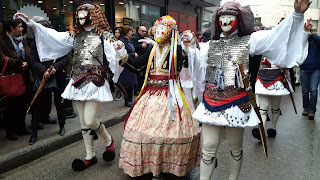 In Naousa it is all about the proud tradition of the "Yenitsari and Boules," which dates back centuries -- even during the dark 400 years of the Ottoman Empire, when money collected during the celebrations was hidden under the skirt of the Boules (men) to buy food and supplies for the Macedonian Freedom Fighters. Each year the entire city follows a specific program of preparation, procession route ("dromemo"), and songs/dances that NEVER changes. Greeks come from all over to see this amazing, historic spectacle. By "Tsiknopempti" (Thursday, February 8th), preparations will be at a fever pitch. But this year there will be something extra in the mix: the opening that day of the XXIII Olympic Games in PyeongChang, South Korea. And as we learned a few months ago, Sophia Rally from Naousa will carry the Greek flag in the opening ceremonies. Wow! 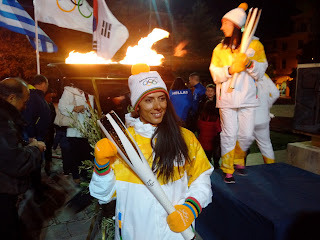 On October 28th, the Olympic Flame came to Naousa on its way to The Games. Sophia proudly ran it into Platia Karanatsou and lit the cauldron for the poignant ceremonies. We were reminded that Naousa -- being located in the foothills of Mt. Vermion with access to the ski areas of 3-5 Pigadia and Seli -- has a rich winter Olympic tradition dating back to 1956. The names of all Naouseans who have skied in the Games were read aloud, and the Odeio Choir braved the cold to serenade our Korean visitors as did the young "Naousa Glee" singers. Beautiful! Sophia will actually be competing in her third Olympic Games along with a few other local skiers. And when she marches into the stadium holding that flag on "Tsiknopempti", all Naouseans will be very proud -- and some will even raise a glass or two of Naousa's renown Xinomavro wine* in her honor...It will be quite a party, wherever you are! *Wine lovers should be on the lookout for Episode #106 of My Greek Table with Diane Kochilas (PBS.) "A Bite of Greek Red Wine' is about the production of Naousa's Xinomavro -- double opa!